drawing circle and marker on tap on Google map. this error came at first line of the above comment. this error came at second line of the above comment. Problem with your manifest file see this line..
You have more than one package in your appliaction? Just make same all package name and press ctrl+shift+O and enjoy.. 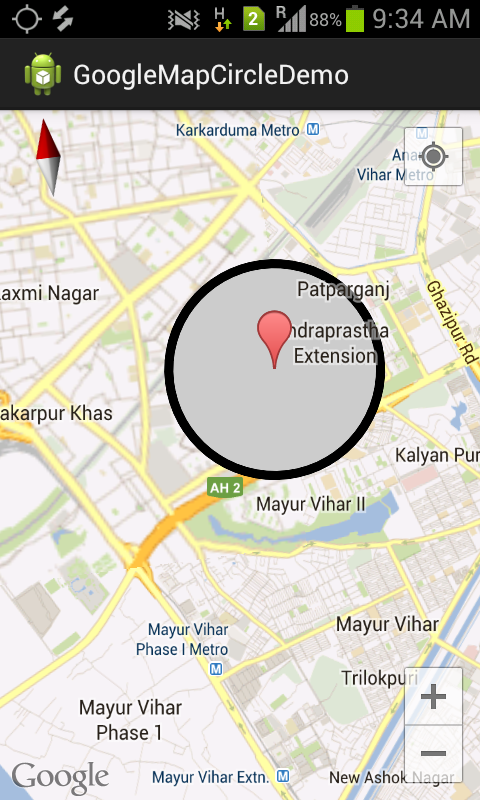 Please see on my post a download link here also..
Hi, How to draw dashed/ dotted circle in map v2 Android? I think you can't it on google map. On google map circle need only (lat,lon) and radius, but in case of canvas you get a path with mid point(x,y). 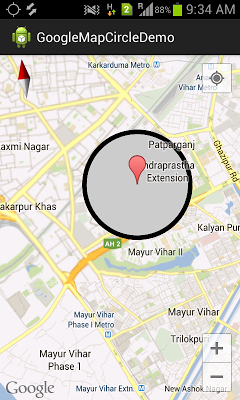 1)Create a framlayout on google-map with transparent background so user can see map. 2)Create canvas on that framlayout and draw circle on drag and put a done button below of that circle . 3)now calculate radius of this canvas circle. 4)On done button click update your app with this circle and hide that framlayout. no error but when i run in my phone.."Unfortuntly,google map stopped."why?? Please check log-cat for reason for stopped google map and post here so i can help you..
error at Binary file line #8.Error at inflating class fragment. AndroidManifest.xml does not have right value...so how....the version of API and android is related?? I go what issue you are getting.. You need one more permission now in your manifest for updated Google Play Services Library. Yes we are doing same..
@Sambit, android SDK does not guarantee to get phone number using Telephony Manager.